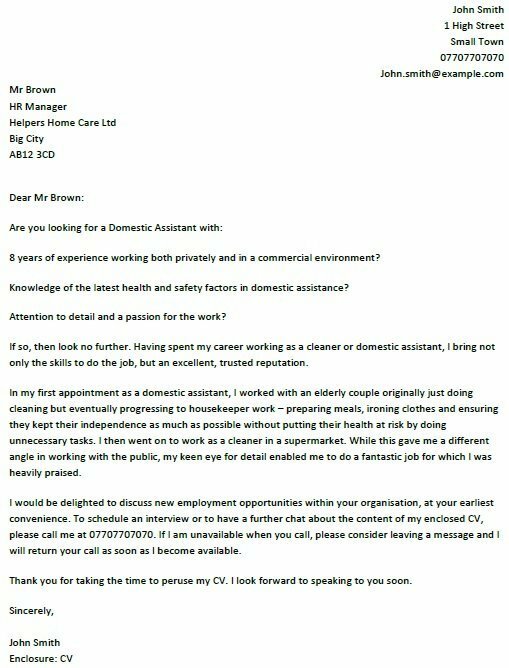 Use this cover letter example for Domestic Assistant job applications. Make sure that you have amended this example before sending it to employers. 8 years of experience working both privately and in a commercial environment? Knowledge of the latest health and safety factors in domestic assistance? Attention to detail and a passion for the work? If so, then look no further. Having spent my career working as a cleaner or domestic assistant, I bring not only the skills to do the job, but an excellent, trusted reputation. 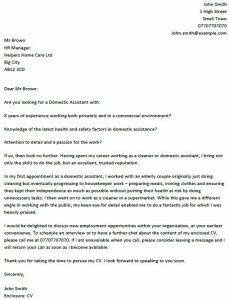 In my first appointment as a domestic assistant, I worked with an elderly couple originally just doing cleaning but eventually progressing to housekeeper work – preparing meals, ironing clothes and ensuring they kept their independence as much as possible without putting their health at risk by doing unnecessary tasks. I then went on to work as a cleaner in a supermarket. While this gave me a different angle in working with the public, my keen eye for detail enabled me to do a fantastic job for which I was heavily praised. I would be delighted to discuss new employment opportunities within your organisation, at your earliest convenience. To schedule an interview or to have a further chat about the content of my enclosed CV, please call me at 07707707070. If I am unavailable when you call, please consider leaving a message and I will return your call as soon as I become available. Thank you for taking the time to peruse my CV. I look forward to speaking to you soon.